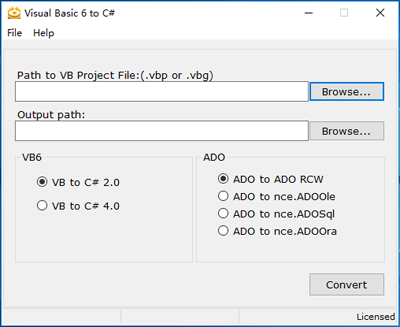 VB6TOCS is an assistant tool that converts Visual Basic 6.0 projects to Visual C# .NET. VB6TOCS creates a new project, converts each file from the original project(.vbp) into the new project(.csproj), and generates a report detailing what was done. After your project is converted, VB6TOCS inserts comments into your C# code alerting you to statements that will need to be changed. Data Report(.dsr) is not supported. Data Control is not supported. Line Control is not supported. Property Page is not supported. Screen Object is not supported. Clipboard Object is not supported. App Object is not supported. 'On Error' statement is not supported. Feel free to contact vb2cs@netcoole.com if you have any questions.